Not Prepared: Will Most Americans Be Absolutely Blindsided By Multiple Wars And A Simultaneous Economic Collapse? Since these were my first true paranormal pics, and I didn't know what to call this website, I just made a quick decision to go with that file name: HELIRODS! So, that's the story behind the name of this website. The camera was of the typical 35mm variety, with manual advance. The photos were snapped about five seconds apart, or so. I will never know for sure. The lens was a rather inexpensive zoom lens. I am not a professional photographer, but a somewhat reasonably well versed amateur. The photos were taken in Fairview Heights, Illinois (very near to St. Louis, Missouri). The film was not developed until a few months later in December, 1997. At that time I had not even heard of rods and thought the objects in the photos were just some weird anomaly, so I set them aside and simply ignored them for a time. The rods were not on any of the other photos on that filmstrip. This same roll of film was used primarily for black and white natural light photos of my now long gone cats. I have also been told that these particular "rods" may only be a close second cousin of the more well known rods of Jose Escamilla discussed below. Whatever the case may be this is just one in a host of phenomena I have imaged over the years. I have determined the exact coordinates where these photos were taken per Google Earth: 38deg 35' 35.10"N 89deg 59' 57.40"W. I was facing approximately southward and upward for the first two pics, then SE for this third shot you see immediately above. Jose Escamilla became ill in 2015 and his website has fallen into disuse so there is not much there anymore. You would probably have to search YouTube and see if any videos of his remain. The photo shown here in the left panel is the third and final photo of the "helirods". There is an inset at the lower right pasted-in showing an enlargement of a rod that is near to the ground. There are other tighter scans and enlargements shown on the photo gallery page. Rods are now merely one aspect of an entire range of things I have imaged since these photos were taken in 1997. Thanks for your Facebook "Recommendation" in advance. NOTE: Facebook "Recommendations" for this site may be disabled by "them". Sometimes it shows, other times not. The numbers have long since been messed around. That's the Kind of Kountry we have now. 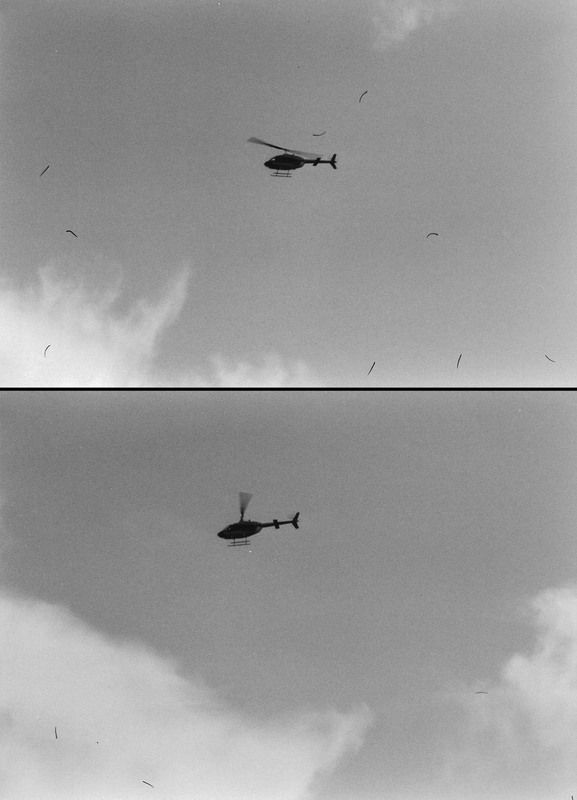 By the time the third photo was taken, the helicopter was too far away to be meaningful ...but, take a look at the rods! Are they playing to the camera lens? In my effort at enhancement you will see that I circled the rods in the last photo. Near the bottom right corner of this photo is a rod very near to the ground. The inset is a tighter scan of this particular rod and this gives a hint as to the size of the rods. Frankly, the whole reason for the photographs was that I thought I might try to get the tail number of the helicopter. I was quite irritated at the noise it was making (this was very near to my house). As you can see, I did not even come remotely close to getting a readable tail number. I later forgot about the incident and did not bother with having the film developed clear until a few months later in December, 1997. I was truly puzzled when I first viewed these photos! It would still be a few months before I would come to hear about rods on the Coast to Coast AM radio show. I would suggest that these are some form of intelligent beings that seem to know when and when not they will appear on film. Could they possibly be some form of "angelic" beings? Just a thought. In recent years, I have come to suspect that there is an entire range of "angelic" types of beings probably all of which are etheric in nature. This would be a long discussion by itself, but I do give it a try on my Angels and More Orbs page. Over the past dozen years or so, I have noticed on various paranormal websites that MANY people have been taking photos that have something inexplicable in them that would only be apparent after the photo was developed (or downloaded form the camera in the case of digital photos) the imaged phenomena was otherwise not visible to the naked eye at the time the photo was taken. In my opinion, this is not happening by accident! The skewing that you see in that third and last photo above is due to the inexpensive zoom lens I was using. Upon close inspection you will notice the building on the lower right appears to be "bent" inward toward the center, along with the tall sign on the left also being bent inward toward the center of the photograph. I know that problem can be compensated for, but the heck with it.